Frequent Case Studies Buyer? 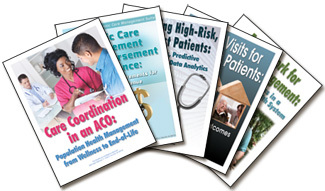 Save more than $500 annually with our Healthcare Case Studies Membership. Click here for details. A laser focus on population health interventions and processes can generate immediate revenue streams for fledgling accountable care organizations that support the hard work of creating a sustainable ACO business model. This population health priority has proven a lucrative strategy for Caravan Health, whose 23 ACO clients saved more than $26 million across approximately 250,000 covered lives in 2016 under the Medicare Shared Savings Program (MSSP). Profiting from Population Health Revenue in an ACO: Framework for Medicare Shared Savings and MIPS Success examines Caravan Health's population health-focused approach for ACOs and its potential for positioning ACOs for success under MSSP and MACRA's Merit-based Incentive Payment System (MIPS). In this 25-page resource, Tim Gronniger, senior vice president of development and strategy, Caravan Health, shares lessons his organization has learned from helping clients manage more than a million patient lives under Medicare. Gronniger outlines the core population health revenue opportunities available to ACOs while they wait up to several years for the value-based model's anticipated shared savings to accrue. Caravan Health has found that population health revenue not only offsets the cost of ACO infrastructure and clinical transformation but can also dramatically boost key quality and clinical metrics. Averaging net savings of nearly $1.1 million per MSSP ACO, Caravan Health's ACO clients also achieved higher than average quality scores and quality reporting scores in 2016, according to recently released data from the Centers for Medicare and Medicaid Services (CMS).